Avocado toast is the latest rage-it’s being offered on menus in almost every cafe and bakery I’ve been to lately. Actually, it’s so easy to prepare at home. No reason to pay a lot for this simple dish! As you probably know, avocados are a healthy food choice; here’s some of the reasons Why Avocados are a healthy food choice. Avocado toast is even more delicious topped with a fried egg; more protein and a great breakfast, especially with some fruit to complete the meal. We like citrus, especially the little tangerines that we find now at farmers’ markets. Here’s my recipe for this avocado treat. With a fork, mash the avocado and the mayo together; (not too smooth- should have some chunkiness). Set aside. Spread avocado mixture thickly on top of the cheese toast. 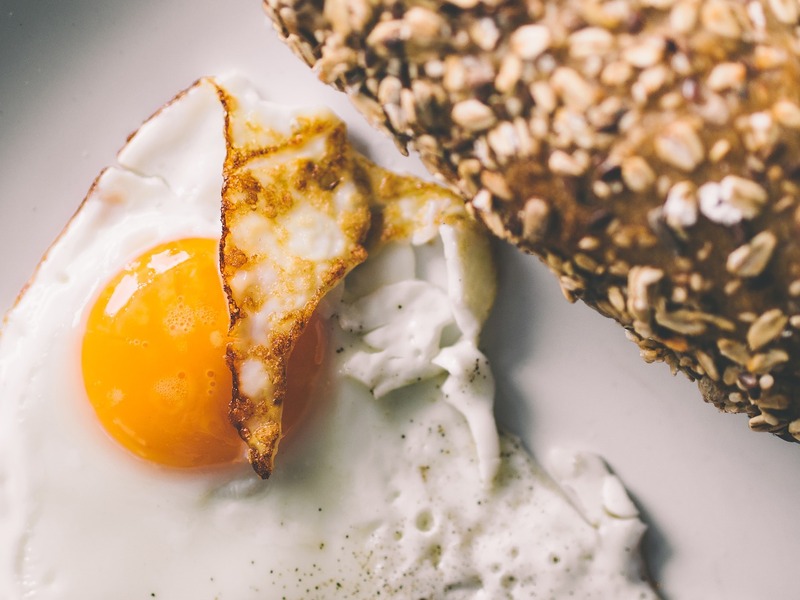 Melt butter in a hot nonstick pan; crack eggs gently into the pan and fry til whites are opaque and edges are brown and crisp; turn over and cook an additional 10-20 seconds (depending on your preference for the firmness of the yolk). Top each avocado toast with hot fried egg. Garnish with fresh chopped herbs. 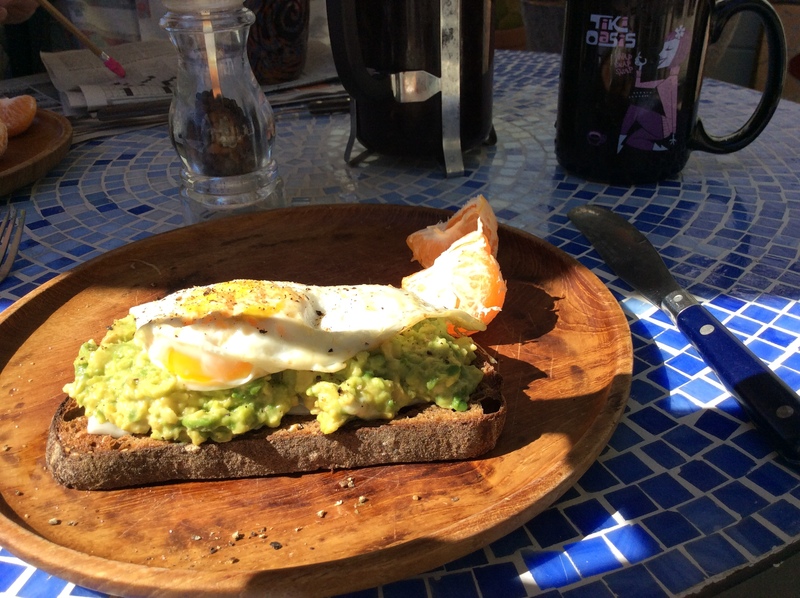 That’s it- avocado toast-so easy and delicious! At brunch, nothing tastes quite as delicious as a runny fried egg with crispy edges (delicately placed atop a crusty piece of bread, of course). But replicating that effect at home is hard. Here, a trick that will help you get golden brown edges—and a soft, yolky inside—every time. What you do: First things first—let the frying pan get scalding hot. 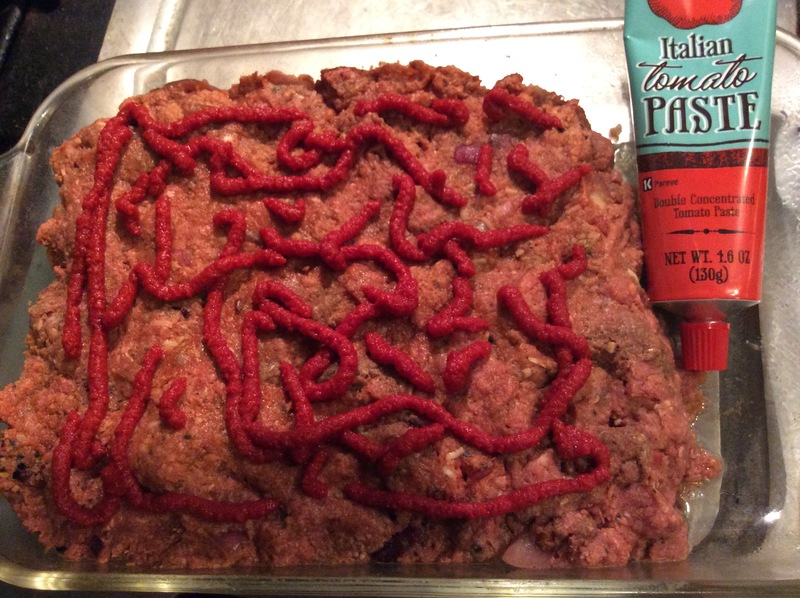 (Usually, this requires letting it sit on the stove for a minute or two.) Next, coat the pan with a thin layer of olive oil. (Two tablespoons should be plenty, depending on the size of the pan.) Crack an egg and let the whites sizzle for two minutes. Here’s the tough part: No matter what, resist the temptation to touch the eggs as they cook. Just let them sizzle in the olive oil and watch the timer. You’ll know they’re cooked when the white part looks opaque. OK, kill the heat. Using a spatula, carefully slide the egg off the pan. The result? Crispy perfection. 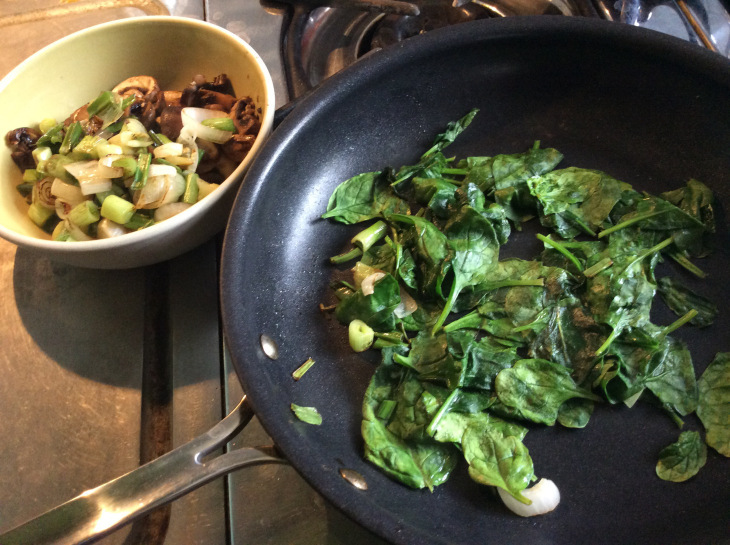 Saute onions, mushrooms and then spinach. Breakfast, especially on a lovely spring Sunday morning after a busy week, is one of our favorite meals. 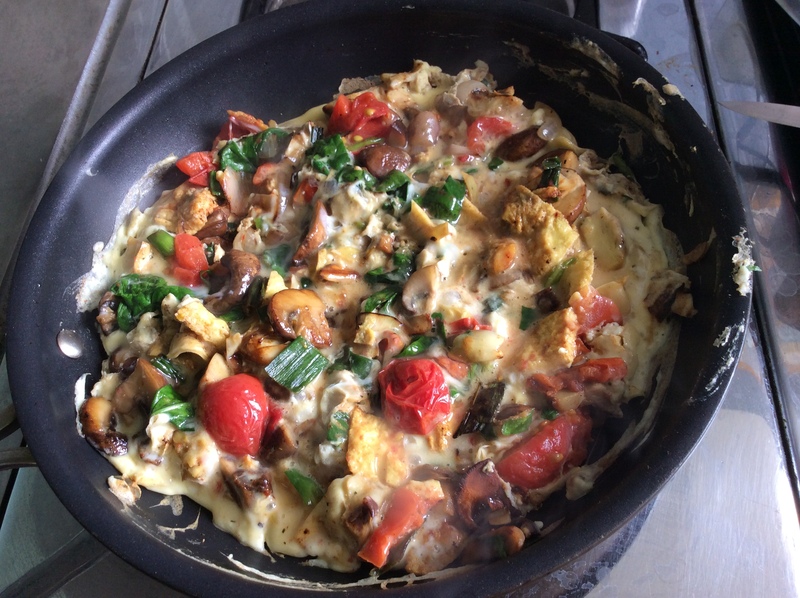 For this dish, I sautéed Spring onions, spinach, Cremini mushrooms, and tomatoes and added eggs and fresh thyme from my garden for a delicious scramble. (I also added sautéed chopped chicken livers–I love them although I know everyone doesn’t share my enthusiasm.) The secret to making them is not to overcook–they should be pink inside. 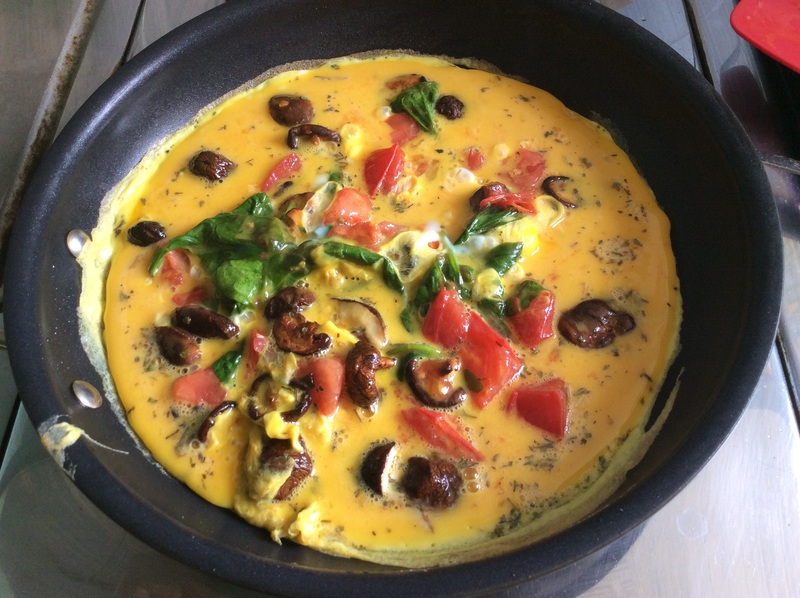 Low carb and so delicious and satisfying! 1. Beat eggs ( I add a tsp. of milk or 1/2 and 1/2- that small amount Rick can tolerate); add seasonings to the eggs, and set aside. 2. Sauté mushrooms in butter; after they’re browned (about 6-7 minutes), add chopped onions and saute until soft, about another 5-6 minutes. 3. 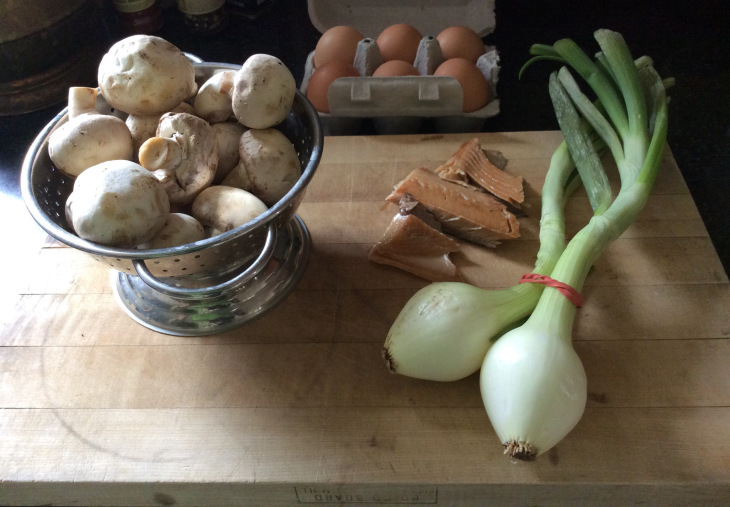 Remove mushrooms and onions to a bowl. 4. Add spinach to the pan; saute briefly, 1-2 minutes until wilted. 5. Sautee tomato pieces in the pan, pushing spinach to the side. 6. Add mushrooms and onions back into the pan. 7. Sautée chicken livers til pink inside (about 3-4 minutes/side) and then chop–add to Mushroom, onion, tomatoes and spinach. 8. Add beaten eggs over the mixture in the pan. 9. Gently cook the mixture, using a spatula around the sides to fold in the mixture as it’s cooking. 10. Cook until barely firm, and serve. 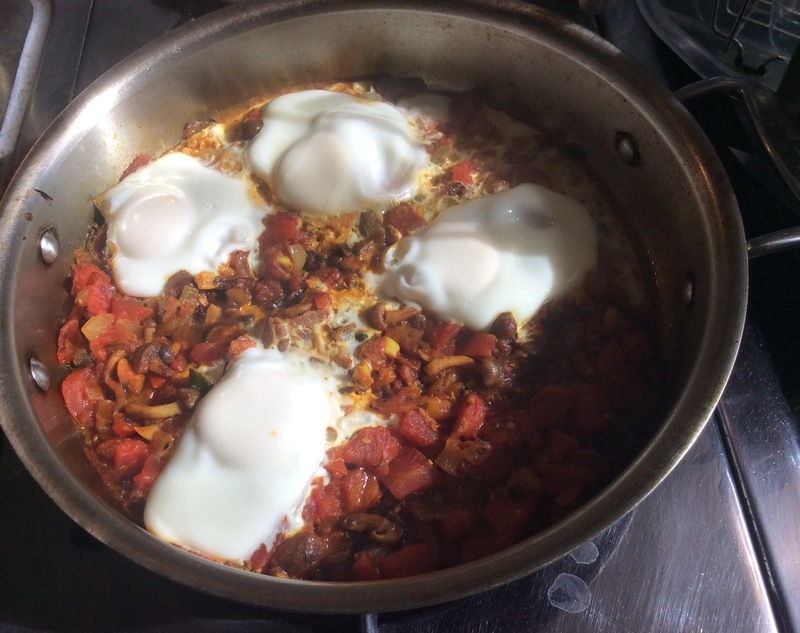 I want to share a new breakfast/brunch discovery–Shakshuka. This is a wonderful skillet dish that originates from the Middle East; I’ve been told it’s a staple in Israel; (not sure what other countries). It’s very delicious and is easy to customize and prepare. You can change out the spices and throw in whatever vegetables you have on hand. For my version I used chopped red pepper, onions, mushrooms, carrots, garlic, and jalapeño peppers (diced) and plum tomatoes. 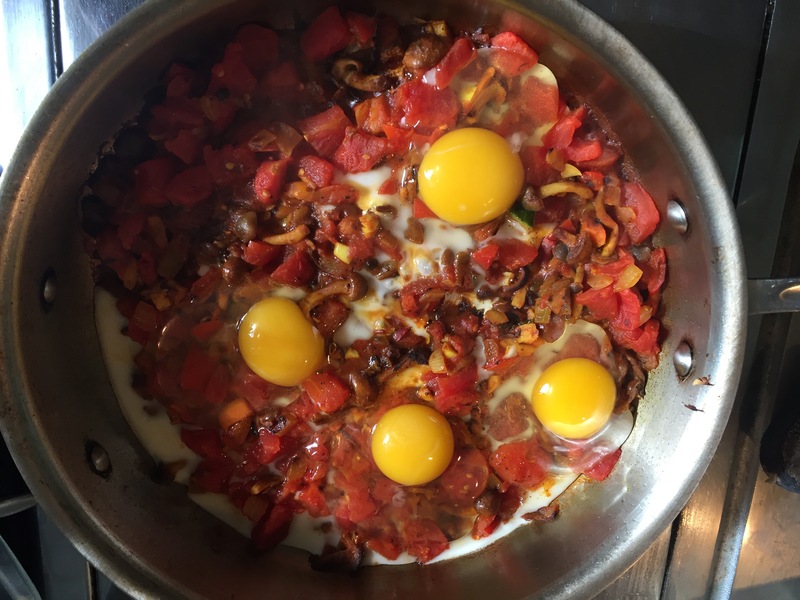 We had it for brunch recently and were knocked out by the combination of sweet tomato flavor, vegetables, spicy undertones of the jalpeno (but not too spicy) and the creamy, rich eggs. It’s now one of our favorites. This is a great dish to serve company or enjoy with your family when you have a leisurely weekend brunch. I suggest you serve with crusty whole grain toast to mop up the delicious sauce! I’ve been out of town and apologize for not posting for a few weeks. Fall is in the air; next I’ll post a hearty fall vegetable stew–my version of Ratatouille. Please follow–stay tuned! 2. Add onion, sweet pepper, mushrooms, carrots, garlic, jalapeños, spices, seasonings. Saute until tender, but not browned–about 10 minutes. 3. Stir in tomatoes and juice. Bring to a boil, then reduce heat to simmer about 10-12 minutes, uncovered; stir occasionally. 4. Crack each egg individually into a small bowl, and and carefully add, one at a time, on top of the vegetable mixture. 5. Cover, reduce heat and cook 5-8 minutes, until the whites are set and yolks are firm but still soft. 6. Serve with grated or crumbled cheese, oregano and/or cilantro. That’s it! Pretty easy and delicious- a feast for the eyes and…! Omelette ready to be enjoyed! Brunch is one of our favorite meals. On almost every Sunday we relax in the morning, Rick works in the garden and I cook a brunch for both of us. 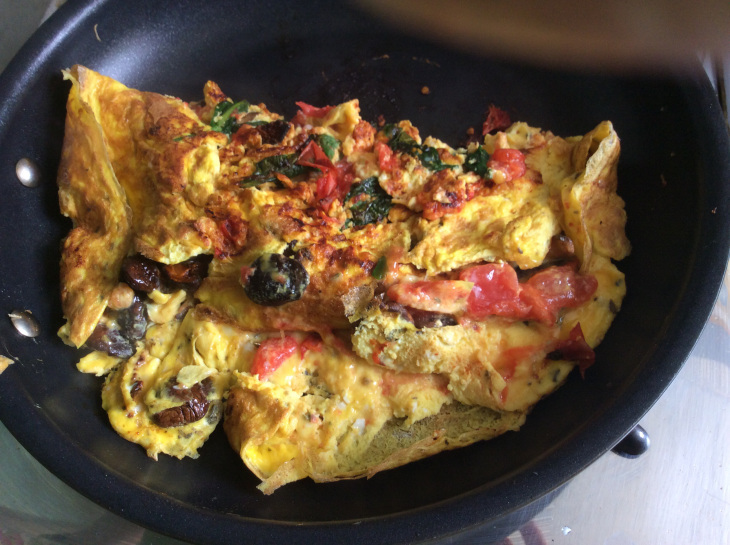 Omelettes are a treat I often make, with a variety of ingredients. Now that it’s summer and our tomatoes are ripe, I try to include them every time. We also are lucky to have a source of fresh eggs from friends with chickens- the yolks are so golden orange they make a beautiful sight, and taste really different, rich and flavorful. I always add at least two vegetables to the mix. 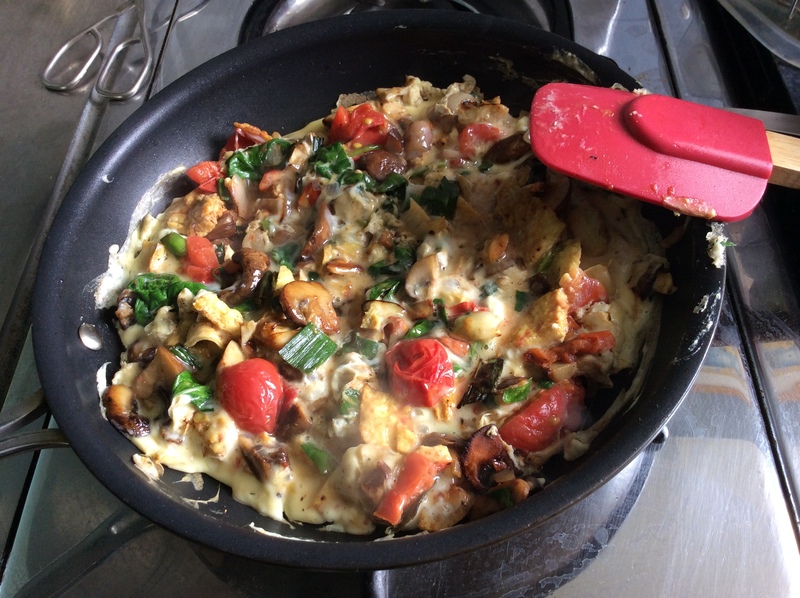 This omelette has spinach, mushrooms, onions and tomatoes from our garden. Often we also have chicken sausages, and whole wheat toast (Rick has one slice, and usually I do too); with goat cheese (me) and Almond Butter (Rick) for a satisfying low carb meal. And yes, I have to have my coffee! Tomatoes, chopped into 1/2″ pieces; I use 1 cup as I love them! 1. Melt 1Tbsp. of butter in a medium frying pan, on medium heat. Add the Tbsp. of oil, and when hot, the onions (they should sizzle). Saute until transparent, about 5 minutes. 3. Rinse the spinach and add to the pan, stirring quickly for 1-2 minutes. 4. Add the remaining butter. Turn the heat to med low or low. Add the beaten eggs and, with a flexible spatula, go under and around the edges of the mixture, until the bottom is firm, about 5-6 Minutes. Fold the omelette over, so that the middle cooks to your liking. 6. Serve with whole grain toast, sausages, etc.– your choice! And, of course, good, fresh, strong coffee! Breakfast, especially on a lazy Sunday, is one of our favorite meals. 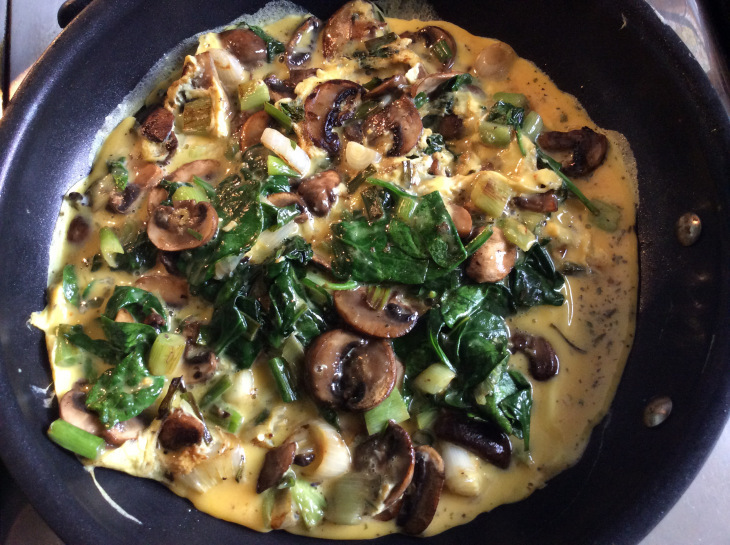 For this dish, I added spinach, Cremini mushrooms and succulent chunks of smoked salmon to an egg scramble. I indulged further to serve with basil chicken sausages, and a few pieces of a really sweet tangerine as an accent to the savory flavors of this dish. Low carb and so delicious and satisfying! 5. 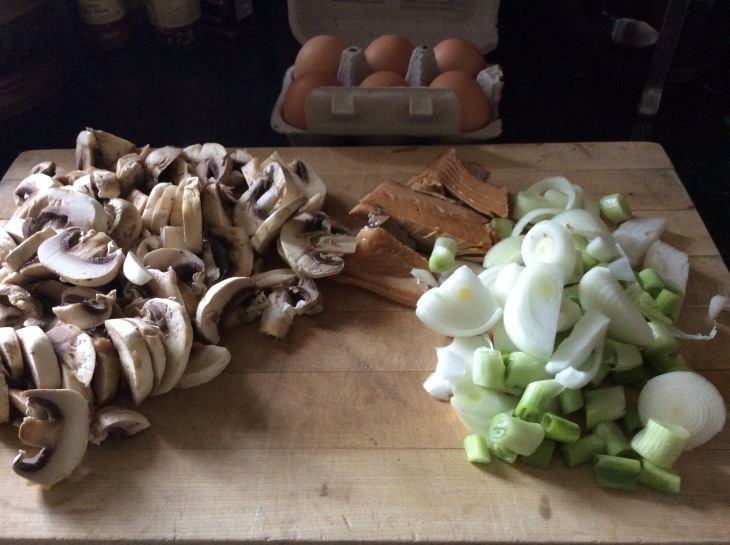 Add mushrooms and onions back into the pan, and add beaten eggs over the vegetables. 6. Gently cook the mixture, using a spatula around the sides to fold in the mixture as it’s cooking. 7. Cook until barely firm, and serve.